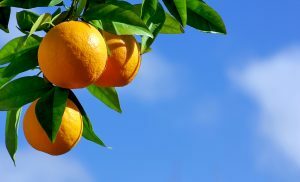 The citrus crop forecast, delivered by Mark Hudson of the U.S. Department of Agriculture’s (USDA) National Agricultural Statistics Service in Washington, D.C., showed a 4 percent drop in Florida oranges and a 2 percent drop in California oranges. In total, the U.S. all-orange forecast for the 2016-2017 season dropped 3 percent from last month and is down 13 percent from the 2015-2016 final utilization. The Florida all-orange forecast, at 67 million boxes, is down 4 percent from last month and down 18 percent from last season’s final utilization. Early, midseason and Navel varieties in Florida are forecast at 33 million boxes, down 6 percent from last month and down 9 percent from last season’s final utilization. The Florida Valencia orange forecast, at 34 million boxes, is down 3 percent from last month and down 25 percent from last season’s final utilization. The California Valencia orange forecast is 7.8 million boxes, down 13 percent from the previous forecast and down 10 percent from the previous season. This results in a California all-orange forecast of 51.8 million boxes, down 2 percent from the previous forecast and down 4 percent from last season’s final utilization. Objective survey measurements taken during January and February indicated that fruit set per tree was lower than the previous year and the lowest since 2009, but the measured average fruit size was slightly above the previous year. The forecast for Texas is carried forward from the previous forecast. Florida frozen concentrated orange juice (FCOJ) yield forecast for the 2016-2017 season is 1.43 gallons per box at 42.0 degrees Brix, unchanged from last month, but up 1 percent from last season’s final yield of 1.41 gallons per box. The early and midseason portion is projected at 1.34 gallons per box, unchanged from last month, but down 1 percent from last season’s final yield of 1.35 gallons per box. The Valencia portion is projected at 1.54 gallons per box, unchanged from last month, but up 5 percent from last year’s final yield of 1.47 gallons per box. All projections of yield assume the processing relationships this season will be similar to those of the past several seasons. See the full USDA/NASS Citrus Maturity Test Results and Fruit Size report. The next USDA citrus crop forecast will be released on Tuesday, April 11, 2017, at 12 noon Eastern/9 a.m. Pacific time. You will be able to hear the forecast here on this website.